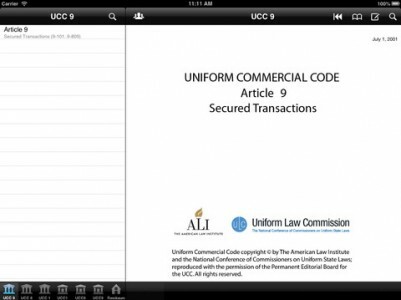 Secured Transactions for the iPad is the complete resource for secured transactions and creditors’ rights. Secured Transactions for the iPad is the complete resource for secured transactions and creditors’ rights. An absolute must for the practicing attorney, judge, law student, or turnaround consultant dealing with issues of perfection, priority, disposition, and foreclosure of real and personal property. DISCLAIMER: The information contained in these applications is not intended to replace an official and/or original source version, is subject to revision, and should not be considered legal advice. This information is provided without any warranties whatsoever, whether express, implied, or imposed by law, including, without limitation to, accuracy, validity, timeliness, or completeness. Always consult primary source material and a qualified legal representative. This disclaimer may change at any time.